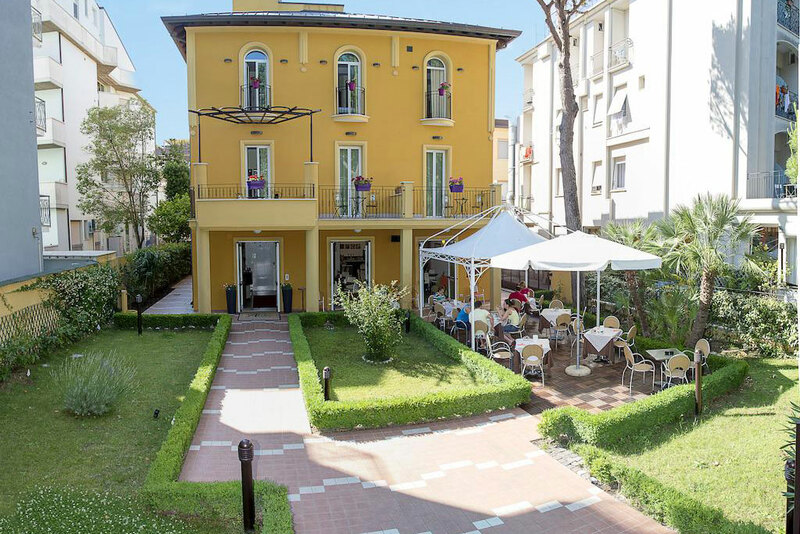 Hotel Alibì is a design 3 star hotel in a vintage building in Marina Centro of Rimini, only 200 meters away from the beach and just a few minutes on foot away from Viale Vespucci, the pulsing heart of the city's nightlife. 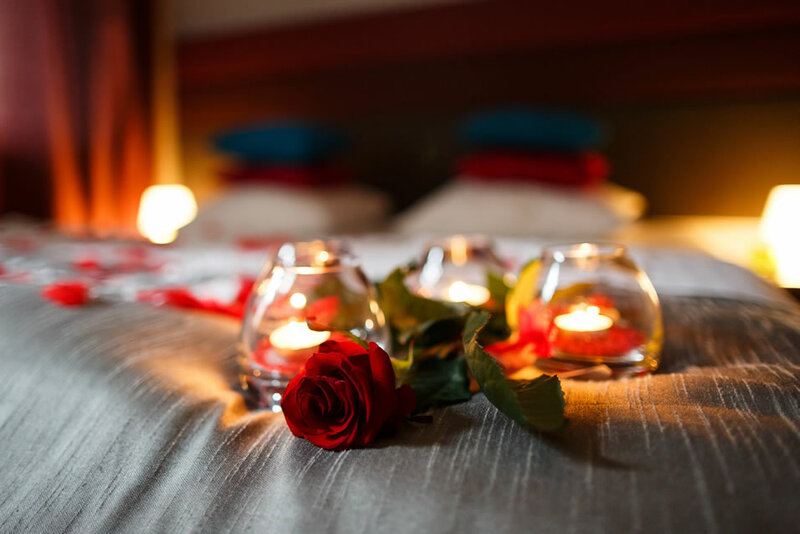 It's the top choice for couples looking for romance, style and comfort. The rooms are modern, and they all have free Wi-Fi, an LCD TV, automatic air conditioning, a safe and a private bathroom with shower cabin and a hairdryer. The day always starts with a rich buffet breakfast, with sweet and savory choices, available until 10:00 AM. Reaching the beach is easy: you only need to walk 2 minutes to reach the shore! At only 200 meters, you can find our partnered beach. You can reserve your space under the umbrella directly from the hotel, effortlessly and at convenient prices. If you want to treat yourself to a different day, you can buy tickets for Mirabilandia and for other amusement parks of the coast, directly from us. Lunch and dinner? You can take advantage of collaborating restaurants and pizzerias, in the immediate surroundings, to eat well at reduced prices. Before that, we recommend you try one of our super aperitifs, to be sipped in our american bar or our garden with a gazebo, perhaps with background atmospheric music. Are you in the city for work? 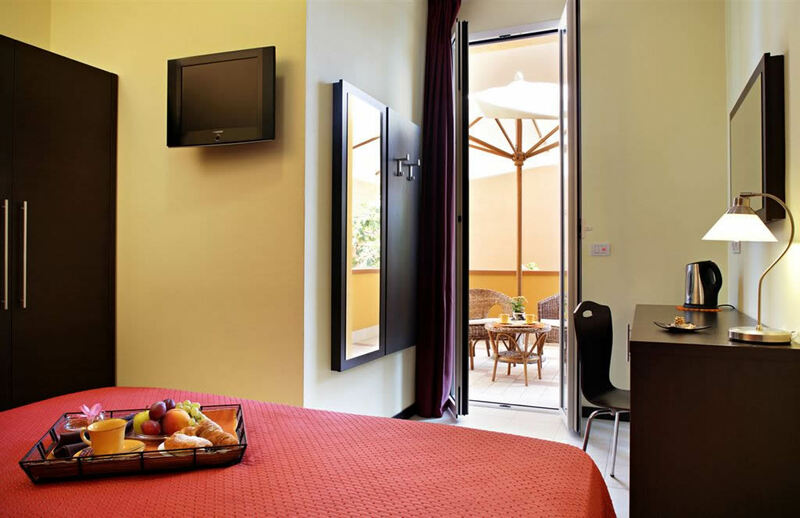 Don't worry: Hotel Alibì is open all year and it's 2,5 km away from Palacongressi and 6 km from Rimini Fiera. If you travel with your car, you can easily reach our hotel, leave your luggage and check-in. During your vacation, you can leave your car in the public spots, free in the surrounding streets, or a collaborating guarded parking (just a few euros per day), 10 minutes away on foot from us. Join our Smart tribe with more than 1.000 happy guests. Our rooms are furnished with contemporary design elements. In all of them, there is free Wi-Fi, an LCD TV, automatic air conditioning, minibar (activated on request), a safe and a private bathroom with a shower cabin and a hairdryer. They don't have sea view. Standard rooms are furnished with contemporary design elements. With essential spaces and no balcony, they are the favorite accomodation by couples looking for the most inexpensive solution. For this type of room, we also have single and triple rooms available, along with two accomodations for people with disabilities. This room has unique contemporary design elements, and a wide balcony for breakfasts and romantic aperitifs. Would you like a personalized quotation? By checking the box above I authorize the processing of personal data supplied by me within limits established by the Privacy Act 196 of 2003. Select the arrival and departure dates and check availability.